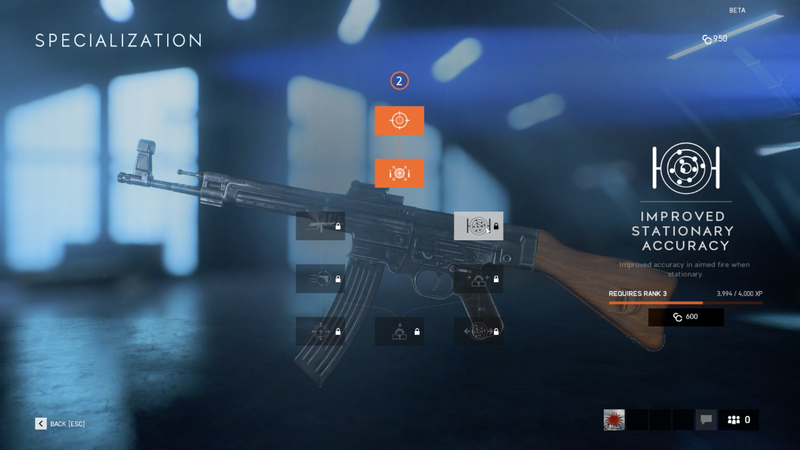 If you played the Battlefield V beta, then chances are, you’ve fiddled around with the game’s gun upgrade/configuration system, which is a big departure from past Battlefield games. This time, attachments are purely cosmetic, and the gun itself had an upgrade tree that branched out, with the player choosing which side to upgrade, and spend the necessary Armory credits to unlock it. If you weren’t a fan of that, then there’s hope for it yet! Over on Twitter, Core Gameplay Design developer Florian (or also known as DRUNKKZ3), posted a long message explaining that the Battlefield V gun upgrade system could still change as the game evolves, and states that he understands why players are missing what Battlefield 3 and 4’s upgrade system. Here’s the entire message in one easy to read format. We are still at a stage where tweaking is needed and i expect that to still be the case once BFV launches, the upgrades in the Open Beta were very much our first real test with actual players and based on feedback as well as the data we will iterate more on those i’m sure. I’ve been reading a lot of feedback on how players feel about the upgrade system in its current form and i totally see what players miss against what we had in BF3/BF4, i would even say that i personally agree. Now on the functionality of what the upgrades bring currently, this isn’t _really_ different than what some of the combinations could bring in BF3 or BF4 for best combinations. …. i’m even wondering if a 2 paths tree is enough to have an interesting sidegrade system. With that being said, we are discussing it internally for sure and it’s not impossible to see changes in that direction moving forward. Extra comments on hip-fire and recoil: We’re not really far from what you could get on BF3/ BF4, in certain cases we actually have much more recoil than popular weapons (ACE-23) in sustained fire. Some weapons however start lower to fit the generally lower ROF of WW2 weapons. As we grow the amount of available weapons in the game, there will be room for more diversity in terms of handling and we will have more difficult weapons that will be more challenging for the more experienced players that outclass weapons more tailored towards the new players. We also need to keep in mind that the current weapon handling and balance needs to work on both console and PC – at this point. With that in mind, we can’t really make the handling too difficult else that would be a bad experience on console generally speaking. Seperating that down the line is something we still have in mind though as this would allow us to ensure the experience can be as deep as possible on both platforms equally and without limitations. As someone who prefers the gun customization and upgrades in Battlefield 3 and 4, I hope DICE can somehow change Battlefield V’s gun upgrade system wherein it’s part of the overall parts (muzzle brake, stock, etc. ), and have a proper give and take when it comes to upgrading them. If not, we’ll see high rank players dump on low level newbies just because the veteran players’ weapons are outright better, which isn’t something you want. This won’t be the only change coming to Battlefield V based on the beta. Respawn time will be tweaked, starting and max ammo capacity will be changed as well. Let’s hope a proper second beta test with all the fixes will really be made available by DICE before the game’s November 20 release date.